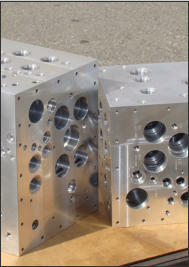 Apollo Machinery has extensive experience in the manufacture of production manifolds in steel and aluminum. 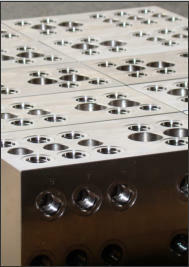 We can work with you to meet your just in time requirements and can offer secondary operations such as anodizing, black oxide and electroless nickel plating. Apollo Machinery can also supply and install valves, plugs and fittings in your production manifolds to provide you with a turn key manifold, ready for installation in your equipment. 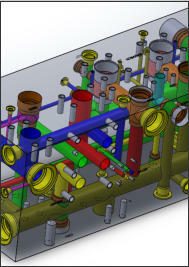 Apollo Machinery uses CNC machines and advanced production methods to efficiently produce manifolds in quantities ranging from 5 to 2000 or more pieces. Trust us to meet your tight production deadlines without sacrificing quality.